Experience and skill always help while hunting turkeys, but the right tools and a little beginner's luck never hurt. Few turkey enthusiasts have been to a hunting camp where a Mossberg shotgun wasn't ready to take on a gobbler. When I headed to South Dakota with a group of friends during a recent season, I planned to borrow a shotgun in camp to make for easier traveling. My buddy who arranged the hunt had an assortment of smoothbores ready for making jellyheads out of sly, old gobblers. There were four Mossberg scatterguns in the mix, including a Model 835 and a newer Model 935-and we wasted little time getting them ready to hunt by putting an Aimpoint red-dot sight on one and a TruGlo red-dot on the other. My friend, Dan Sturgess, was along for his first-ever turkey hunt and latched onto the camo-clad 835 like it was a long-lost friend. 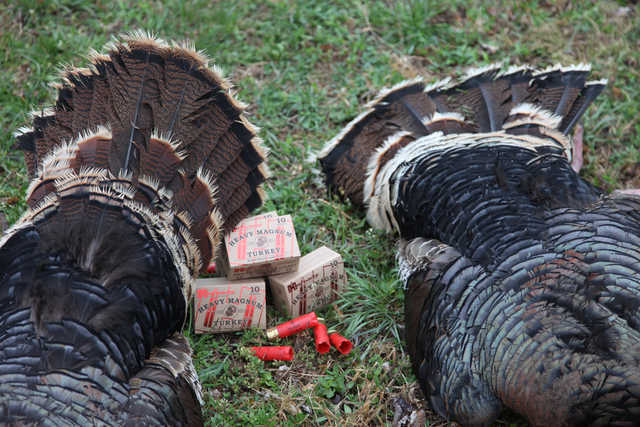 We headed to a makeshift range behind camp and stapled turkey patterning targets to the board to fine-tune our guns. We outfitted the barrels with TruGlo Gobble-Stopper Xtreme choke tubes, which produce an extra-tight turkey pattern and are ported to help reduce the recoil of heavy magnum turkey loads. I opened a box of Hornady Heavy Magnum Turkey nickel-plated, 3-inch number 6 shotshells, and planted a pattern on the paper at 30 yards. There were more holes in the target than I cared to count, so I knew I'd be ready for the next morning. When we turned out the lights, Dan was still asking questions about what we'd experience on our quest for South Dakota gobblers. The next morning, we headed out in a dense blanket of fog for Dan's first turkey hunt. Not sure how the fog would affect our hunt, we headed in separate directions to strike that first gobble of the morning. Our hosts knew the country well, and when the sun should have made an appearance, the turkeys started to talk. Unfortunately, the birds I was set up on were across a river and, no matter how hard I tried to convince them to fly across with tactical calling sequences, they simply wouldn't. Mid-morning I met up with Dan, and the smile on his face told a unique story. Dan had spotted a strutter along the river in the fog and set up with a Primos Chicken on a Stick fanning decoy to try and bring the bird in close. They snuck in and closed the distance to less than 50 yards before throwing up the decoy. The gobbler immediately locked onto his competitor. 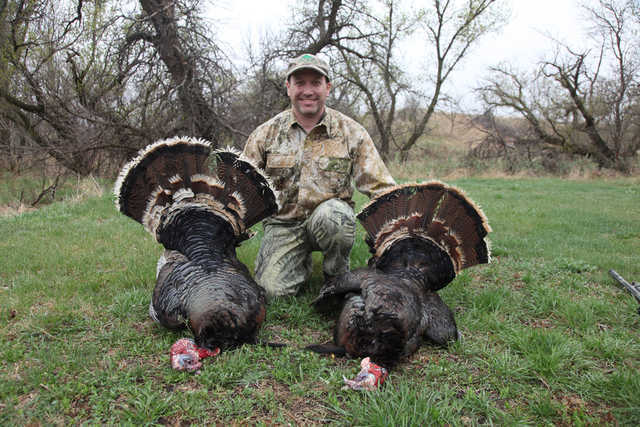 In less than two minutes, Dan was just seven yards from the big-roped bird and his Mossberg roared. 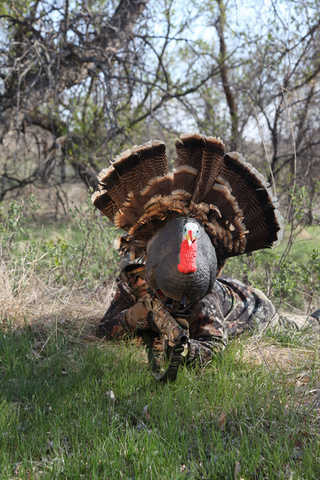 Dan's first bird was a whopper by any standards, with long spurs, a thick beard and weighing in at more than 20 pounds. To top off his day, they spotted two more strutters a couple hours later and once again flew into action. 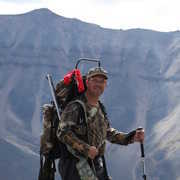 Jim Clarke, our other hunting companion, was in on this stalk and they used the river to approach to within 150 yards. The birds immediately responded and marched towards the decoy. Four minutes later, Dan and Jim shot the pair at just 12 yards. 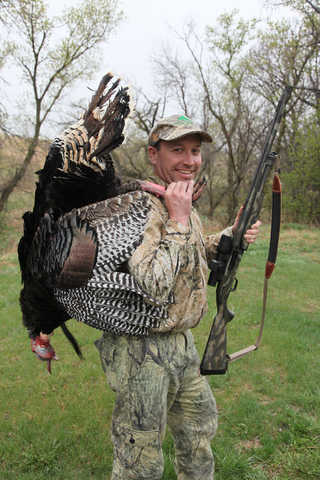 Dan's first day of turkey hunting filled both his tags in less than 4 hours. Both birds were at least three years of age-and this hunt will be a tough act for him to follow.